We’ve seen this game from Rand Paul before. Step 1: Make a big show of having libertarian principles that make him break from normal Trump Republicans. Step 3: Do what Republican leadership orders him to do. Rand Paul, my friends, is a professional boot-licker. A principled man residing in a chamber typically decided by two partisan votes can wield a lot of power. 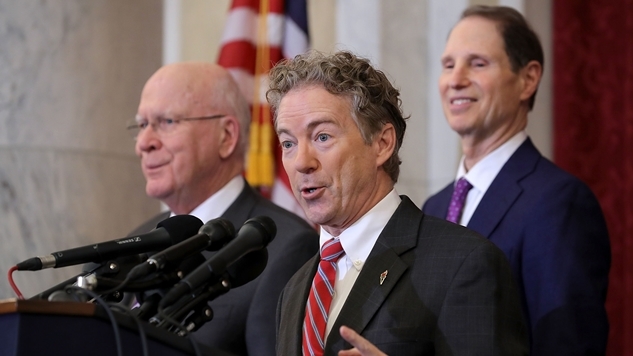 If Paul were to recruit one more person into the Rand Paul caucus, he would practically control the entire Senate. Immense power is not only on the table for America’s most famed libertarian, it’s a moral calling based on his stated principles. And yet, Rand Paul has no power in our most powerful legislature, because he chooses not to seize it. Rand Paul’s principles are worth nothing, because he doesn’t vote on them. He talks about them, causes some mild consternation in the Republican Senate caucus, and then votes the way he is told at the end of the day. Oh look, let’s everybody pay attention to Rand Paul again, a man who would really like to be president, but isn’t openly racist enough to win his party’s primary. Mystal’s amazing article is based around Rand Paul pretending like he may hold up Brett Kavanaugh’s nomination to the Supreme Court over serious 4th Amendment concerns. Rand Paul likes to cosplay being a champion for privacy, but the man has actually done nothing to curb the sprawling surveillance state he claims to so abhor. Which brings me to our second news peg for this story: Rand Paul is going after our intelligence services, but in a much less libertarian, and far more Republican manner. The Atlantic's Natasha Bertrand brought some important contextualizing receipts to this latest round of embarrassment from the Junior Senator from Kentucky. Rand Paul is not a libertarian. Speaking (or writing) as someone who’s entire political worldview rests on a distrust of large institutions, I have investigated the libertarian cause in the past. His crazy racist father, Ron Paul, is much more emblematic of the movement than Spineless Paul, version 2.0. Unequivocal libertarian principles like the right to privacy (AKA, the 4th Amendment that Rand Paul claims to cherish so dearly) should be central to any modern political ideology, but self-professed libertarians like Rand Paul refuse to really, truly, fight for their stated ideals. One last Fourth Amendment rant before we wrap this up: Rand Paul is pretending to care about Brett Kavanaugh’s history of opposition to privacy rights, yet has largely poo-pooed another 4th Amendment-esque violation against Americans by the Russian government. Any intrusion into voter rolls, which contain sensitive data like partial social security numbers, should send alarm-bells ringing throughout Libertarianarnia, and it’s telling that neither the Russians nor Kavanaugh will meaningfully move Rand Paul to fight for his stated principles. So in closing, I would like to apologize to you, the reader, for making you momentarily think about a man unworthy of your attention. Rand Paul doesn’t matter, and it’s because he chooses not to. Please continue going about your normal life where Paul has zero (positive) impact on it whatsoever.